This entry was posted in news and tagged JCW MINI Clubman press press kits on September 20, 2016 by James Day. Nearly a year after the MINI Clubman went on sale, MINI has debuted the MINI John Cooper Works Clubman. 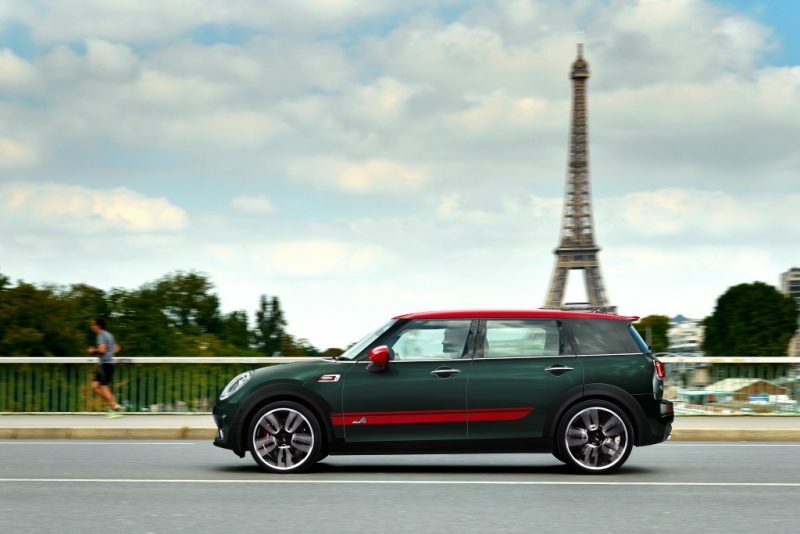 The JCW Clubman will make its world premiere at the 2016 Paris Motor Show. Having conquered the small car category, the latest generation of the John Cooper Works model family now takes the premium compact segment by storm, too. 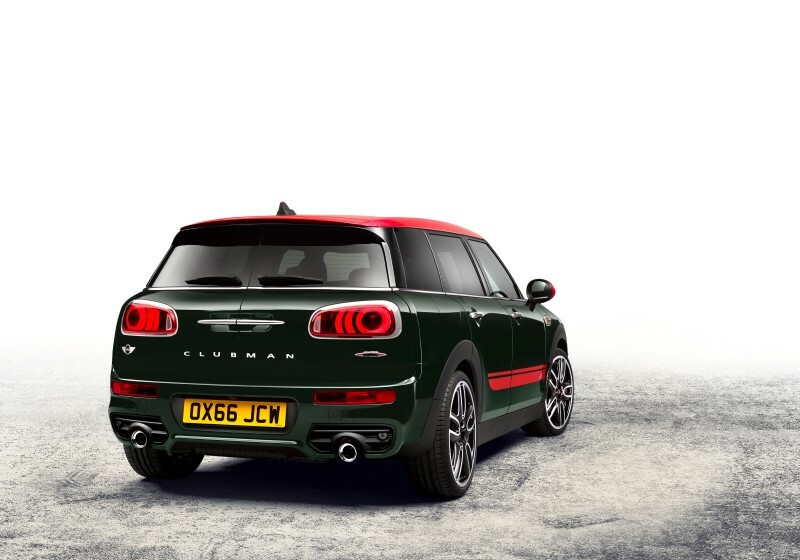 In terms of its exterior dimensions and space, the new MINI John Cooper Works Clubman is the biggest top athlete in the history of the British brand to date. The bonus in terms of roominess, everyday practicality and long-distance suitability offers a new range of opportunities to enjoy racing passion. Premiere for the first John Cooper Works model of the latest generation in the premium compact segment; new MINI John Cooper Works Clubman combines authentic race feeling with the most space, everyday practicality and long-distance suitability ever realised in a model of the brand; drive and suspension technology developed based on motor racing expertise, the all-wheel drive system ALL4 as standard and the versatile interior enable unique flexibility in terms of both driving properties and functionality. Extreme driving fun and an exclusive aura due to the precisely harmonised package of engine, suspension, aerodynamically optimised exterior and sports car flair in the cockpit that is typical of the John Cooper Works models; the distinct vehicle character is given additional emphasis with model-specific standard features including LED headlamps, MINI Driving Modes, Park Distance Control, Comfort Access, Radio MINI Visual Boost, multifunction buttons on the steering wheel and cruise control with brake function. First ever combination of the current 2.0-litre petrol engine developed for John Cooper Works models with the new generation of the all-wheel drive system ALL4; 4-cylinder engine with MINI TwinPower Turbo Technology and 170 kW/231 hp; engine output 29 kW/39 hp higher than that of the MINI Cooper S Clubman; new version of the ALL4 system optimised for weight and efficiency with electrohydraulic regulation; 6-speed manual transmission as standard, 8-speed Steptronic sports transmission optionally available; combined EU fuel consumption: 7.4 l/100 km (automatic: 6.8 l/100 km, combined EU CO2 emissions: 168 g/km (154 g/km). New MINI John Cooper Works Clubman with unique performance qualities, fascinating characteristics and powerfully emotional sound development; traction-optimised power transmission to all four wheels; acceleration from zero to 100 km/h in 6.3 seconds (automatic: 6.3 seconds); sports exhaust system, Brembo sports brake system, 18-inch John Cooper Works Black Grip Spoke light alloy wheels and Dynamic Stability Control DSC including Dynamic Traction Control DTC, EDLC (Electronic Differential Lock Control) and Performance Control as standard; Dynamic Damper Control and 19-inch light alloy wheels optionally available. Innovative shooting brake concept, unique in the compact segment and interpreted in challenging, sporty style; dynamically elongated silhouette with long roof line; four side doors; sloping rear with hallmark split doors; Air Curtains and Air Breathers as well as other typical John Cooper Works design features to optimise aerodynamic properties; front section with especially large side cooling air inlets instead of parking lights and fog lamps; model-specific side sills; wide rear apron with integrated, tapered dual tailpipes of the sports exhaust system; John Cooper Works rear spoiler; hexagonal radiator grille with honeycomb pattern and cross member in Chili Red; John Cooper Works logo on radiator grille, side scuttles and rear; body finish in Rebel Green, red contrasting finish for roof and mirror caps, sport stripes in red or black as options available exclusively for John Cooper Works models. Five fully-fledged seats; luggage compartment volume: 360 litres; by folding down the rear backrest, optionally available in a 40 : 20 : 40 split, the luggage volume can be expanded to 1 250 litres; touchless opening of the split doors as standard; storage package, roof rails and tow hitch with removable ball head optionally available. High-end display and operating concept; instrument panel on the steering column; hallmark central instrument with standard 6.5-inch colour screen and optional 8.8-inch colour screen; toggle switch series including start/stop button for keyless activation and de-activation of the engine; centre console with armrest, MINI Controller, electric parking brake button, storage facilities and two cupholders; optional MINI Head-Up-Display with John Cooper Works specific display content. Characteristic interior design in sports-car style; John Cooper Works sports seats in Dinamica/fabric and Carbon Black with integrated headrests; John Cooper Works door sill finishers; roof liner in anthracite; John Cooper Works leather steering wheel with multifunction buttons and shift paddles in conjunction with the 8-speed Steptronic sports transmission; gear lever or selector lever and cockpit displays in model-specific design; pedals and driver footrest in stainless steel. Weight and crash-optimised body structure; standard safety features include front and side airbags, side curtain airbags, ISOFIX child seat mountings at the rear and optionally also on the front passenger seat, tyre pressure display as well as Intelligent Emergency Call and collision warning with city braking function; LED headlamps with LED daytime running light, white turn indicators and LED rear lights as standard; adaptive light distribution and turning light as an option. All driver assistance systems offered for the new MINI Clubman also available for the John Cooper Works model: rain sensor with automatic driving light activation, Parking Assistant, rear view camera and Driving Assistant including camera-based active cruise control, collision and pedestrian warning with initial brake function, high beam assistant and road sign detection. Standard comfort features including air conditioning and Radio MINI Visual Boost with 6.5-inch colour screen, USB socket, AUX-IN socket and Bluetooth hands-free facility; wide-ranging options for additional driving fun and comfort including 2-zone automatic air conditioning, panorama glass roof, seat surfaces in Dinamica/leather, seat heating, MINI Excitement Package including LED ring for the central instrument, ambient lighting with adjustable colours and MINI logo projection from the exterior mirror on the driver’s side when opening and closing the door, heatable and folding exterior mirrors, interior and exterior mirrors with automatic dip function, heatable windscreen, Harmon Kardon hi-fi speaker system, alarm system including red LED status indicator in the fin antenna, MINI navigation system and Wired equipment package including navigation system Professional, operation via MINI Touch Controller and 8.8-inch colour screen with touch function. Additional customisation options for the exterior and interior in the distinctive style of MINI and John Cooper Works: sport stripes, chrome-plated exterior mirror caps, Chrome Line interior, lighting package, MINI Yours sports leather steering wheel and MINI Yours Interior Styles in three variants. Current selection of MINI Connected in-car infotainment functions; Intelligent Emergency Call and MINI TeleServices for use with permanently installed SIM card; constantly updated range of apps for integration in the car via smartphone; MINI Connected App as a personal mobility assistant with wide-ranging functions in the car and on the smartphone: appointment reminder, calculation of travel time based on current traffic data, pedestrian navigation to car park, route guidance, filling station and car park search, last mile navigation to meeting point, online-based services for the use of entertainment offers such as Spotify, Stitcher, Amazon Music, Deezer, Audiobooks from Audible, Napster/Rhapsody, TuneIn, Glympse and Life360. MINI John Cooper Works Clubman: 4-cylinder petrol engine with MINI TwinPower Turbo Technology (turbocharging, direct injection, fully variable valve control, variable camshaft control), capacity: 1 998 cc, output: 170 kW/231 hp at 5 000 – 6 000 rpm, max. torque: 350 Nm at 1 450 – 4 800 rpm, acceleration (0–100 km/h): 6.3 seconds (automatic: 6.3 seconds), top speed: 238 km/h (238 km/h), average fuel consumption: 7.4 (6.8 litres)/100 kilometres, CO2 emissions: 168 g/km (154 g/km), exhaust emission standard: EU6.